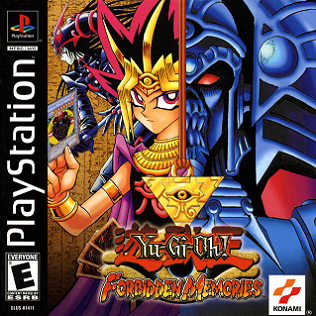 Released on the original Playstation during its final days, Yu-Gi-Oh! Forbidden Memories capitalized on the latest card game craze during its peak in video game form. While the quest was monotonous, it was at least straightforward: defeat everyone in your path as Yugi traverses from his past and current lives in order to save the world. The real fun was the game itself. For its time the graphics were quite good and simple, bringing the beloved card game to life albeit with alternative rules. Players could fuse monsters with not only magic and trap cards, but without the use of Polymerization. It is unknown why this was inserted into the gameplay, but it makes the game much easier at times, especially since the player does not have very good cards for a long time. An additional rule that was put into play was the use of “guardian stars.” When a player sent out a monster they would have to choose one of two guardian stars that would either put them at an advantage, disadvantage, or stay the same depending on the guardian star their opponents monsters have. Even the animated series didn’t have rules that bizarre. Most of the game is done in “Free Play” mode, as the player only receives new cards once they have beaten an opponent. If they should lose during the campaign, it’s game over. The free play mode is where they’ll want to go sharpen their skills and get better cards to upgrade their deck for the campaign. Since the cards you are rewarded seemingly come at random based on your speed and performance, the player will spend most of their time in free play, which is not necessarily a bad thing as the story is actually very short. At the end of the day, Yu-Gi-Oh! Forbidden Memories came down to the heart of the cards as it opened a new way to experience the game, turning out to be one of the best time killers one could ask for. If you weren’t a fan of the card game, you could still enjoy this game for hours on end.